Emilia Moreno Calderon was born in Espanita, Guanajuato, Mexico on May 26, 1926 to Domingo Moreno and Agustina Calderon Moreno. Immigrating from Mexico Emilia settled in Pescadero, California and later in Madera California where she has resided for the last 14 years. She passed away in her home surrounded by her loving family on Tuesday, November 6, 2018. A retired Agricultural worker, she was a member of the Roman Catholic Church, attending St. John Bosco Roman Catholic Church in Modesto, CA. 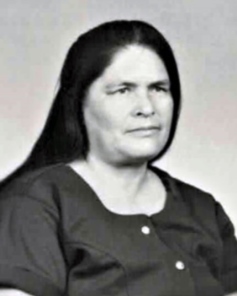 In addition to her parents, she was preceded in death at early age by her husband Fidel Garcia in 1957, left to raise her young family as a single mom. Emilia is survived by her children, Adolfo Garcia and his wife Elena Garcia of Mexico, Fidel Garcia Jr. of Mexico, Maria Dolores Ruiz and her husband Jesus Ruiz of Madera, California, Elvia Alfaro and her husband Moises Alfaro of Santa Cruz, California. Emilia is the beloved sister of Humberto Moreno of Mexico, Onesimo Moreno of Stockton, California and Concepcion “Concha” Moreno of Mexico. Emilia is the cherished grandmother “Abuelita” to 21 grandchildren, and 40 great grandchildren. Visitation will be on Tuesday, November 13, 2018 from 2 PM to 7 PM at Jay Chapel with Recitation of the Holy Rosary at 7 PM. Funeral Rites will be on Wednesday, November 14, 2018 at 11 AM at Jay Chapel followed by interment at Calvary Cemetery in Madera. The Clergy of St. John Bosco Roman Catholic of Modesto will officiate.